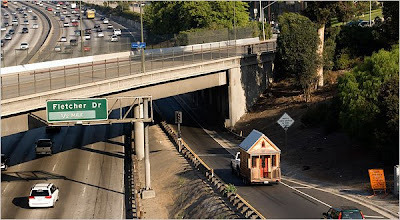 Fortunately, itsy bitsy houses are all the rage these days. Yesterday, the New York Times had a great audio slide show of some of the options that are currently available. My choice? Frankly, I'm torn between the modern wee house and the charming Loring from Tumbleweed Houses. Which one would you choose? Loring, definitely - it's so cute! personally, i like the Loring! I would go with the Loring. It's a little more gingerbread. (cuz im kida a stalker/evil cute girl that can take a wimpy boy or nerd, easily) LOL! some dudes dont know... OKAY sooo off topic! soo really choose the weehouse (P.S. im not being evil and trying to make u choose the WRONG house, i really lke the weehouse).